We've shared with you case studies covering two of our life sciences clients. Today, we have one of our energy clients, BP, on the record. BP usually holds an annual three-day conference in London to mark the culmination of its Graduate Induction program. Graduates network with BP executives and get fully indoctrinated into BP's corporate culture and values. But the company took a completely different approach for its most recent conference. 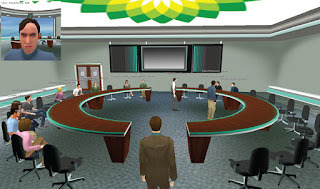 BP used ProtoSphere to create an immersive learning and collaboration environment for its graduates. I think you'll find the project and results to be very compelling. BP certainly did. It calculated savings of $3.7 million compared to producing a physical event. That's just one major benefit the company realized. You can read about the rest, as well as BP's complete virtual world deployment story, below. We also have a fancy PDF coming shortly, which we welcome you to share with colleagues. BP holds its Global Graduate Forum annually in London. The three-day conference marks the culmination of BP’s Graduate Induction program. After two years with the company, some 450 graduates from 70 BP offices worldwide are given the opportunity to attend the Forum. Those who sign up travel to London for three days of networking with BP’s top brass, peer networking, and indoctrination into BP’s corporate culture and values. The program cost $5 million annually, yet only a third of global graduates attended. In some geographies, only one in 10 graduates attended through a lottery. Attendees characterized the event as “a PowerPoint festival,” and said their generation demanded more interaction. And by 2008, economic pressure to contain expenses was strong, resulting in travel restrictions and other cost-cutting measures. Company officials sought an alternative. They insisted any new approach achieve three goals. First, it must ground participants in the company’s broader business objectives to qualify them as managers of the future. Second, it must create global networks that allow BP to quickly identify and share best practices around the world. Third, it must connect BP’s future leaders with the company’s senior leadership. It also had to meet BP’s technical requirements, including compatibility with myriad IT environments; secure global access; realistic avatars that looked like the graduates; fast and reliable performance; and real-time document sharing with full screen views on demand. The solution also had to be cost-efficient with measurable ROI. ProtonMedia’s ProtoSphere was among 15 technology platforms tested and considered. The joint BP/ProtonMedia team developed a scenario-based teaming project, dubbed the “Global Graduate Challenge” (GGC). 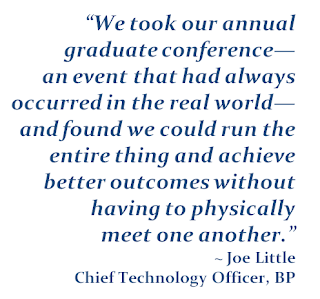 The month-long event would divide graduates into 15 teams representing BP’s future leadership. The year would be 2025. The teams would face a realistic dilemma that required them to measure up energy security against environmental pressures. A fictitious territory would hold immense promise for oil and gas reserves, but it would be cold and desolate, hard to access, and home to protected species. The graduates' dilemma: Decide whether to tap the protected region’s alternative energy resources. The decision was also made to expand the scope of the event from three days to several weeks, because a virtual event doesn’t have to be bound by time and travel restrictions. Using an iterative process with weekly project meetings, it took several BP and ProtonMedia teammates six weeks to design, build, and launch a secure virtual Global Graduate Village in ProtoSphere. The team also engineered how people would move and interact in the Village. The resulting immersive space had 51 futuristic rooms, including briefing rooms, conference rooms, and 35 team rooms. Each briefing room held 24 people, featured a flat-screen TV to view videos created for the challenge, a Wikipedia document describing in detail the fictitious territory, a schedule of subject-matter expert (SME) sessions, and an intelligent bot to play back audio to the students. Some featured audio conferencing. All supported VoIP, chat, document sharing, and text chat, and whiteboard interaction. A two-week beta test was held to train grads on the environment’s basics, swat bugs, and verify secure access through different firewalls at 70 BP locations. The challenge kicked off in March 2009, with 178 graduates taking part. Teams were organized within two or three time zones of each other. Every day the graduates entered ProtoSphere and went to their assigned rooms. A bot told them what was on the schedule for that day, such as an SME session, documents or materials required, or tasks they had to complete. The 22 SMEs were executives, VPs, and directors from a variety of internal disciplines. Exploration experts covered access and geography of the theoretical region. Health and safety executives covered safety. External affairs people covered how to work with government. Managers covered project management, and executive and public communications. The sessions typically lasted 60 minutes, with 15 minutes of presentation and 45 minutes of Q&A. In addition, simulated news videos covered the issues of the day. Multiple “interventions” were staged, where bots representing the views of interested parties around the globe made their case. In one case, bots keen on opening up the land for exploration presented, followed by bots so opposed to the possibility that they threatened legal actions. Another intervention had bots from oil and other national companies presenting their exploration strategy. That was driven by actual competitive intelligence data, and gave the graduates a realistic view of how competitors might play off of anything BP does. Ultimately, the grads had to collaborate in ProtoSphere to produce a 15-minute shareholder presentation on what BP’s strategy was going to be. They used ProtoSphere’s application sharing and social networking tools to share information with one another and access data to present their findings. Some used video capture technology to record their sessions as part of their presentation. A quantitative study of the event was conducted by a consortium of three universities, led by Duke University. A qualitative study was conducted by MIT Sloan Business School. The study looked at expectations across the board, and concluded the experience was “positive in all aspects,” according to BP’s Joe Little. “When people compared it with Web conferencing and other online events and technologies they’d had, the [Global Graduate Challenge] came out with a positive response across the scale,” says Little. The grads learned to use ProtoSphere in 10 to 15 minutes. Most reported they were “impressed” by the seriousness of the environment, its corporate branding, and “futuristic” feel. They cited ProtoSphere’s integrated approach as superior to a collection of stand-alone tools. Graduates overwhelmingly said the experience expanded their understanding of BP’s business. They also strongly agreed that it exposed them to BP issues and activities outside of their current role. They agreed the GGC further developed their leadership, project management, and problem solving skills. Most also agreed the program allowed them to build new global networks; and discuss business issues, options, and solutions with senior executives. Grads characterized the project as “a significant learning experience” that allowed them to acquire “significant know-how.” Most agreed the project enhanced their teamwork, and made it possible to work more effectively with others online. They also agreed the SMEs/senior leaders who presented were “relevant and insightful,” and the sessions were “enjoyable and engaging.” In fact, they reported the virtual SME sessions were among the best aspects, brought the challenge to life, and gave it credibility. A majority said they preferred the GGC’s integrated virtual world over Web conferencing and other point solutions for online collaboration. They felt comfortable approaching and asking questions of senior executives in the virtual world, compared to discomfort in the real world. They said the virtual environment fostered better communication and collaboration between grads and superiors, because the graduates could share ideas and thoughts more readily. In the end, all of the teams demonstrated a strong understanding of the concepts being presented. And the top three teams demonstrated an advanced level of applying knowledge to the challenge. When the final numbers were tallied, BP found the virtual Global Graduate Challenge saved the company $3.7 million, compared to producing a physical event.